The ocean is as beautiful as it is scary. The 2018 Underwater Photography Of The Year (UPY) contest have just announced its winners, and they have perfectly captured the many treasures of the world down below. All photos had to be taken underwater (split-level images were permitted too, as long as a part of the image was underwater). There were also no restrictions on post processing. Photographers from 63 countries submitted more than 5,000 photos to compete in the 11 categories as well as the grand prize. German photographer, Tobias Friedrich, was the one who got it. Tobias' piece is called ‘CYCLE-WAR’ and shows a panoramic view of the shipwrecked SS Thistlegorm, stocked with rows of 16H motorbikes loaded into Fordson WOT 3 trucks. Friedrich said he chose the location because he had been there a few years previous, but hadn’t caught the right shot. The second time around still proved to be a challenge. For underwater photography there is more to a shoot than getting the right angle, the photographer elaborated. For competition judge Peter Rowlands it was this kind of artistic composition that set Friedrich apart. It's always fun to dive with and photograph seals but this encounter was extra special. I had not seen any on this dive probably because it was late afternoon and they were enjoying a sensible nap on shore. I was beginning to lose hope when out of nowhere a head popped up out of the kelp and gave me an inquisitive stare. It disappeared again as quickly as it appeared only for the head to pop up again a few moments later in what I can only describe as a game of 'Peek-a boo'! The water was murky and flash was not really an option, but we were shallow and it was a bright afternoon so anticipating where the head was likely to appear and using a wide aperture and as fast shutter speed as I could, allowed me to capture this memorable experience and the face of my playmate. I always look forward to diving the wreck of the Caribsea and seeing the fierce-looking, but docile, sand tiger sharks that frequent the wreck. On this day as I descended to the wreck, I couldn’t believe what I was seeing. Millions of tiny fish, collectively known as "bait fish", were grouped together in an enormous bait ball above the wreck, with dozens of sand tigers lazily meandering among the fish. As I slowly swam to the center of the bait ball, I looked up and noticed a sand tiger a few feet above me. I swam on my back underneath her, trying not to startle her. As I moved with the shark through the water the bait fish parted way, giving me a clear shot of the underside of this beautiful shark, and also one of the most incredible experiences I’ve had yet as an underwater photographer. During spring time from April to June on the coast of Baja California we can witness one of the most impressive migrations of the sea. Thousands of mobula ray's migrate along this coast. I try many times to find this incredible behavior but some how this has not occurred. This year, during a morning safari on the sea we saw a different group of beautiful mobular. I jumped in the water and we followed them for a couple of hours and during this time a small group moved into a shallow area where I was able to shoot in great light. I'm a freediving Vice-World Champion and can dive up to 83 meter while holding my breath. But diving deep is only one small part of my passion for the underwater world and for me, freediving the Mexican Cenotes has been a dream for many years. As freedivers, we explore the abyss on one breath only, in its purest way. It allows us to move gracefully through the water and makes time stand still for a moment. The calmness, beauty and serenity of this remote Cenote magnified the state of tranquillity inherent in our sport. The picture shows fellow freediving underwater photographer Guillaume Bihet. Together we create our images and share our work as Seadrops Photography. Freediving gives us the perfect tool to move around freely and improvise. Taken with natural light only, in Nah Yah Cenote, Yucatan Peninsula, Mexico. WOW. There's something about this one. Very neat. I have always been fascinated by over-under photography, connecting the everyday terrestrial world that we all know with the less familiar underwater secrets. I chose Loch Lomond as the location for this shot due to its idilic scenery, water access and friendly swans. My initial idea was to frame a split shot of one swan feeding below the surface of the water but when I noticed how comfortable they were around me I was confident, with some patience, I could get that magical shot of the two. It was mid-day, sun high in the sky, I waded slowly into the shallow water, allowing the swans to become comfortable with my presence. When they began searching for food below the water line I just had to wait for that perfect moment of synchronicity. This is a Japanese pygmy seahorse, a lot of creatures in order to protect themselves, will stay in their own and similar color environment, so the adjacent color in the natural color will be easier to find. When I took this shoot, I used a large aperture and tried a variety of different combinations of lighting methods to blur the background to highlight the subject, but at the same time using the adjacent colors in the background, and then vivid contrast in harmony. The purpose is to make it a more unified background and subject, with a pink background to set off the subject, can make it a lovely character, give a better impression. Looks like it's partly made of sequins! In French Polynesia, there is a healthy shark population thanks to their strong protection. It is my favourite place to photograph sharks as they often frequent shallow waters, which are perfect for split shots. It was my intention to go out at sunset and try to capture an over-under of the sharks. This shot was challenging as there was only a short time period when the sun was at the horizon and it required multiple attempts over several days. A small aperture, large dome port, and flash were used for this image. Sadly, up to 100 million sharks are lost every year, mainly due to overfishing and the high demand for shark fin soup. Sharks signify a balanced marine ecosystem. It is my hope that images such as this will capture peoples' attention and help raise awareness for sharks and other marine animals throughout the world. Each year, I go to Tonga to lead a small group of nature enthusiasts to photograph humpback whales. Tonga offers probably the best opportunity to interact with the whales in blue water. This year was very special, with my friends we had sone of my best moments in my underwater photographer's life: Very curious and playful whales came to investigate us and adopt the spy hopping posture in front of our masks. Although weighing several tens of tons this mammal showed incredible agility and power in holding itself vertically in the water. It was very impressive and we could feel the power of nature but we were also invaded at the same time a feeling of gentleness. I had the chance to freeze this moment with a split shot to recreate a spectacular moment. The pond I was in has the highest density of seahorses on Earth, but I?ve never seen three together like this before. I was camping on shore and had all night to shoot with the idea of backlighting a single seahorse, but finding three together was a real gift. I was super careful not to disturb them because they will swim away if they?ve had enough. I had my off-camera strobe and an underwater flashlight on a small tripod which I placed behind and below the trio. Then I waited for them to all turn in way that you could see their silhouette. The sun was setting and as it got darker the plankton really began to pile up. When the seahorses ate some of the plankton I could tell they were relaxed. We are still working on getting this special place protection so I cannot reveal the exact location. GOD! This one is awesome!! When diving was finished for the day, I asked the divemaster to take me back again to a place, where seawater crocodiles are usually seen. I wanted to shoot them in low evening sunlight, when the sky turns into warm colours. When we arrived, the sun was already on the horizon and it was very dark in the water. I pushed ISO settings high to get some warm ambient light into the picture and set the power of my strobes low. Fortunately the crocodile was very cooperative and since we were both very calm, beautiful reflections appeared on the surface. I shot many images with his reflections and this one was my favourite. Since there is a strong graphic element in this picture, conversion into black and white made it even more powerful. I've had many encounters with this conger eel and I've have taken a few photos, but never have I seen it in such a picturesque manner as this, As if drawing you in by coiling its body and at the same time darting its eyes on a lone prey - it is because of breathtaking sights like this that I fell in love with underwater photography and to do it justice I really aimed to capture the moment in perfect detail. To capture the intricate details of the subject, proper strobe positioning was the key factor in getting the shot that I wanted as even a little error in lighting would rob the picture of its immaculacy. what is that fish?that is so cool. TK3 dive site, looking for some organism to photograph, when from the sandy bottom comes the muzzle of a eel Moray eel (Black-Saddle Snake Eel (Ophichthus cephalozona) and around her a shrimp scavenger (Periclimenes venustus). The shrimp rises on the muzzle of the moray eel and balances like an acrobat on it, for a unique photo and for a unique duet. This image was created from scratch. I went to a quarry and had the usual cavern and cave pictures in mind but I wanted to make something different, too. I thought of playing with dry ice to see how it behaves underwater. It bubbles violently and dies off quickly. A piece of orange gel was fixed onto a torch which created a virtual "fire" with the right colour temperature. After a few experiments we were ready for the real picture next day. We had bought sausage at a gas station and hammered together a few pieces of firewood. The rest was easy: a good model, natural light under the ice cover, the right shutter speed and a few shots. I am proud of this image as it is the result of our own innovation and not copied from somebody else! Looks so realistic - cleverly staged!! Visiting the Mexican Cenotes was like a dream for me. This picture was taken with natural light and on one breath only, while freediving. Arriving in Mexico, our disappointment at finding 'The Pit' closed for freedivers instantly disappeared when we discovered the remote Cenote Nah Yah. A hypnotizing bundle of sunbeams lightened up the crystal clear water into the depths, contrasting with the darkness. In this picture fellow freediver Guillaume Bihet is descending into the deep. Together we create our images and share them as Seadrops Photography. Inside the Cenote the water was completely still and silent. But the small water movement resulting from the descent created a circular pattern on the surface, beautifully contrasting with the straightness of the beams underwater. This is one of two Asian small clawed otters which I followed for a couple of days in their rewilding training in the jungle of Palawan, Philippines. They were rescued as babies and people are trying to release them back into the wild after extensive training in the sea, the jungle and various freshwater areas. As these creatures are super agile and fast it was very hard to get a satisfying image. I had hundreds of bad images out of focus or just half of one otter in frame. It was horrible! The river might be in a tropical region, but the water was just 10°C and after long hours without moving I was close to hypothermic, but the final image was worth it. This species is facing extinction in the near future due to habitat loss. I hope there is still time left to save these incredible animals. What a beautiful little thing! So very sad that they are facing extinction. We found a pod of Orcas that were circling some herring caught in a net. The animals keep circling the net and we could approach them easily to take some close up shots. This green turtle (Chelonia mydas) hatchling was photographed in the world’s first turtle health research facility, 'The Caraplace', at James Cook University in Townsville, Australia. The facility caters for the needs of turtles under near-natural conditions and enables researchers to study turtle health up close, to better understand the management of diseases and the environmental conditions that affect turtle populations globally. Photographed under carefully controlled conditions, this healthy hatchling was playful and inquisitive, frequently approaching and nudging the camera, myself, and other objects in its temporary home. When relaxing at the surface, hatchlings will tuck their front flippers 'behind their back' – changing their silhouetted shape from below and potentially reducing the likelihood of being noticed by predators. It was a wonderful opportunity to observe and photograph such a beautiful creature this closely, while learning about the research and efforts to protect marine turtle populations facing global environmental change. In winter time in the Izu peninsula in tokio area the asiatic cormorant stop for couple of month before moving to China. So this is the best moment for try to shoot this amazing sea bird during diving and fishing. I Was in this area and I spent two days in a very shallow waters from 5m to 8m waiting for the opportunity to take a right moment for have this photos. Luckily four birds for two days stay in this aera in search of sardine and don't care about my presence during his diving session give me the chance to sort it. fish "Im being eaten and photoed for the whole world to see"
The picture was taken in Kuril Lake ? the place with the highest concentration of bears on our planet. The bears here are not hungry (due to the annual mass spawning of sockeye salmon) so they get used to people and do not feel danger from them. I used a remote control system with a 10 meter cable. I left the camera in the shallow water in the river next to the path that bears regularly pass and hid 8 meters from the camera. This day my camera was spotted by four cubs, which were walking along the path with their mother. The mother stopped and began to look out for the fish in the river, and the cubs saw the camera, they were very curious and began to play with it. Bravely and beautifully done! What a nose! Anyone who has spent time on a boat has probably looked down to see a flying fish gliding above the surface. They leap out of the water and fly through the air before dropping back into the ocean and swimming away. This is what one of those flying fish looks like from below. This image was taken during a blackwater dive off the coast of Palm Beach, Florida. Typically, these dives are spent anywhere between 20 and 60 feet below the surface looking for tiny critters in the larval stages. However, when the conditions are right and the wind is calm, a whole new cast of characters near the surface comes into focus. Although I’ve seen flying fish in other colours such as white, orange, and yellow, the blue and silver is certainly my favourite. The clarity and detail - amazing. Cenote Nariz is the entrance to a large cave system in Yucatan that I dove for the first time with my 3 buddies Tom Groesslinger, Rainer Schwanner and Michael Faatz. When I saw this perfect window opening into a large room ahead of us I signaled my team to stop. After mind mapping the spot I swam very cautiously through the window and placed 2 strobes in slave mode on either side behind the opening. Then I signaled my buddies to swim through the opening. 2 divers should be in the picture, catching the light from those strobes. For background lightning each one held a slave strobe and pointed it backwards. One diver (out of sight) fired off 2 more strobes for even more background lighting. After many photo dives together we have worked out our own signals, so they knew what I wanted and they performed perfectly. This was taken on the last day of my trip to La Paz, Mexico. Los Islotes is one of my favorite dive sites, well known for its sea lion colony. This group of three were some very friendly juveniles that were playing in a cave. These pups are easily amused and make for cooperative photo subjects! Make sure all equipment is firmly attached, there may have been some lens covers lost in the taking of this photo! So sweet that these pups are playing. I was practicing sunset split shots in the calm waters around Ras Um Sid when I noticed several people walking down the pier with snorkel gear. My first thought was to wait until they were out of the way, but then I realized that THEY were the story. I wanted to preserve how the colors in the sunset seemed to mimick the colors of the corals so I decided a silhouette shot would meet my needs best. I have been traveling with musician and professional surfer, Donavon Frankenreiter for about four years now. On a recent surf trip to Tavarua, Fiji I captured this shot of Donavon playing under the wave at Cloudbreak. When shooting surf photography I love being under the wave. There is just so much more going on there. Seeing the power of the wave from below and watching the surfers dive below it. It's the side of the wave that you don't get to see from the shore. Well he's underwater... good form though. It took a lot of time and effort to get this picture. I backlit the fish with snooted flash and another close to the dome port. In addition I used another flash for overall lighting. I shot the crab feeding for some time and then it attacked the camera dome! Ready for a closeup? Yikes! For six years, the 251 foot long ex-USS Kittiwake sat upright where it was sunk as an artificial reef. On October 8, 2017, it was discovered that powerful surge from passing hurricane Nate had rolled the ship onto its side. I raced to find a dive operator to take me out there, and was able to dive and document the shipwreck the very next day. I was showing those initial photographs to my husband and my friend when I had an idea: "Wouldn't it be funny if a diver with Obsessive Compulsive Disorder (OCD) was so bothered by the ship being on its side that they tried to right it?" The idea for a photograph was born! My friend Simon Claeys modeled for me in the photograph. In order to make it look authentic, Simon actually 'attempted' to push the ship upright. The bubbles in the photograph are from his effort. Just be careful you don't dislodge it and cause it to fall on you! This photo is part of a series of seven consecutive images that I took of an exceptional and very difficult scene to be seen concerning the coupling dance between two seahorses of the Hyppocampus guttulatus species. The whole phase of the coupling lasted 15-20 seconds. I was very intrigued by this mammal who adapted to marine life and had in mind to witness of this scene. So I asked to my Scottish friend Richard Shucksmith who knows this species very well to help me to capture this image. During a dive we were very lucky to find this otter who was curious about my lens. These sandbar sharks are all male and have probably come together to feed or spawn. A school of females may join them later in the season but in the meantime, they must establish a hierarchy. Sizing each other up, the dominant sharks attempt to secure the better spots nearer the surface. Corveta General Pereira d'Eça (CORDECA) was a Portuguese corvette that the Navy donated to be sunk and turned into an artificial reef in July 2016 in the island of Porto Santo. The boat lays in about 30m depth, in an area completely deviod of life. I managed to dive this site three times before life started to colonise it. On my second visit my wife modelled for me and allowed me to carefully compose this view of the bow, getting this nice perspective that together with the black & white processing and the absence of sea life makes the boat look like it's in the middle of nowhere and thus telling it’s story. The preparation for this shot included the use by the model of a bright orange lycra suit on top of a wetsuit, guaranteeing a high contrast in the blue water. So tranquil. Would love to see a pic after life takes hold. This car went through the ice but luckily nobody was hurt. My friend dove the car and told me that it was a perfect photo subject. I drove four hours to get there on a sunny day. We cut a hole in the ice 20 meters away. When I got to the car I could not believe my luck. The car was perfectly placed on a slope and in shallow water so that I was able to get the icy ceiling in the picture. The picture is a manual blend of two images. The best car Volvo ever made. Just after the sun had set, I was about to get out of the water as I had been photographing the green sea turtles during sunset but I then noticed a large turtle underneath me swimming very fast. I assumed it was chasing another turtle, so I quickly dove down to see what was going on and then saw two turtles come together and flip upside down. As I tried to capture a few shots of them, the turtles then rose to the surface and started mating there. I quickly changed my settings and proceeded to try and get an over-under shot of this unique behavior which was a challenge as the turtles were splashing about and spinning in a circle. This is the only time I have seen turtles mate although there are many turtles in Hawaii thanks to their strong protection under state law. In recent years, oceanic white-tip sharks have become rarer in Red Sea but they are back around the offshore reefs of Egypt. Diving with these magnificent predators is a privilege and offers incredible photographic opportunities and to witness the symbiosis with pilotfish. Curious, confident and inquisitive they do not hesitate to approach the divers and I was able to capture this image on our decompression stop. Maybe once a year due to prolonged and heavy rainfall the water at Cenote Carwash can become very tannic; meaning the water is stained a reddish brown by the tannins from decaying leaf and other organic matter in the run-off from the jungle. As soon as we dropped down through the water it was clear that things were very different from a usual dive at Cenote Carwash. It was extremely dark due to the tannic water filtering out a lot of the light (hence the high iso). The light coming through the water was very red and a bit like diving on Mars! I knew immediately that I wanted to take the classic 'Cenote Carwash entrance' shot but with this very different background with the intense shades of red. Red nose juvenile garfishes are numerous to hunt for prey among Uitoe bay.To make the shoot good, you have to get near to the fish for the light not to dazzle him but you need enough light for the focusing. I went to dive this site to photograph Mediterranean black coral but during the dive I discovered various shark egg cases in different stages of evolution. Unfortunately I had a wide angle lens on so it was not possible to get the right shot. The next day myself and the dive guide went back with a macro lens and during the session he called me over because one of the egg cases had started to hatch and a baby shark was emerging! I took some photos s fast I could of this incredible moment. Cue the "Jaws" theme played on kazoos. The idea was to try and transfer a sense of movement to the image; to be able to capture movement frozen in an instant. what is this? It's fascinating! The seahorse looks so scared of the diver, poor thing! Velvet swimming crabs, with their red eyes and blue pincers are a popular subject. This one caught my eye not because it was in itself photogenic, but because it was hunkered down on a rocky reef dominated by vase sea squirts (Ciona intenstinalis). Whilst these sea squirts are common enough in sea lochs, in this particular spot they were really clean and about as abundant as I can ever remember seeing them. So, for an animal which mostly tries to be relatively inconspicuous, this one had failed pretty miserably. I was very fortunate as the visibility was good enough for me to back off with the 50mm macro lens so that I could take this 'view' including the crab, rather than simply take its portrait. Interacting with sea lions is a great experience, they are curious and playful with divers. In this picture we can see an endemic sea lion from Australia who was having fun standing on the sand posing in front of my camera. The conditions that day were excellent for making the image with the sun's rays piercing the surface. Glorious whiskers and a velvety nose!! When I originally booked my surf trip to Fiji, I didn't realize how close Tonga was. I had always wanted to go to swim with the whales so I made a last minute adjustment to my flight and jumped over. Everyone I talked to strongly advised against going to Tonga without a guide lined up but I figured a bad day swimming with whales was better than going back home. As luck would have it I found a group that was leaving early. I was able to take their spot on a boat with just one other diver and it was just us hanging with this mom and her calf. The calf was a wild one, breaching and tail slapping all over the place. I love this photo because it looks like mom is giving the baby a talking to about straying too far from her. "Son I need to talk to you about..about men things, come on"
Evening, anchored in the lagoon on the motoryacht that hosts us, lights on at the stern, suddenly a great whale shark appears from the obscurity of the seafloor, completely surrounded by remore.Immediately I take my derailment with my camera and slide slowly into water. I begin to take many photographs of this beautiful animal made even more fascinating by the remors that keep him company. It continues to swim around the boat in search of plankton, giving the impression of a large spaceship traveling with its guests. I have been visiting Kootenay Lake, and spending time on its rocky beaches, for the past 5 years. During these years, I have spent a few evenings trying to capture an over-under that showed the beauty of this wonderful mountain lake with clear mountain skies. To-date, the skies have yet to be clear on a night while I was shooting! In the summer of 2017, when this photo was taken, there were a number of forest fires burning in the region which provided the misty and beautiful pink hue to the skies. Sad about the forest fires but the image is beautiful. Part of the joy of diving is coming across the unexpected. A dive at Gilbert Goudge Guddle in Loch Hourn gave gave my first (and, so far, only) opportunity to dive amongst a large aggregation of moon jellyfish (Aurelia aurita) in relatively clear water. The swarming mass of pulsating animals, set against the striking emerald green water of the sea loch was quite hypnotic. Although I was set up with a macro lens, I wanted to try to take an image that showed the density of the animals and conveyed the feeling of being amongst them. Looking upwards, animals in the water column were silhouetted against the light from the surface, whilst my single flash enabled me to pick out some of the colour in the individual closest to me. I took several images but this is the one that gave me what I was looking for. I shot this photo in Yakushima Japan,there is lot’s of rock pools, and many blenny living inside.In fact, I specifically went there to take reflected photo of blenny there.Photography in a rock pool is a very interesting experience, you must know the tide time there,and reflex photographs can be taken only at low tide. Because only at this time, the water surface closest to blenny to form a reflection. When I was taking this photo,a bubble that may have been released from photosynthesis by algae floated near the blenny,and it seems to be looking at the bubble. In order to keep the surface calm, I held my breath, kept myself still, took this picture. I am so happy to record this interesting moment. The pristine reefs around the Jardines de la Reina on the south coast of Cuba are littered with colourful corals and sponges. On this particular dive I had chosen to shoot macro and I slowly passed over the reef looking for all manor of small critters to use as potential subjects. I was lucky enough to come across this small juvenile grouper hiding within a pink sponge. Although a common fish on the reef, the pink sponge made a perfect background, so I opened my aperture to blur away the detail in the sponge and waited patiently for the fish to turn and look straight down the barrel. A few frames later, I had my shot. Jewel in the pink mist. Diving with a manta ray one is always full of emotions. One of the best places in the world to dive with them is the Maldives. You can even meet them on a night dive just off the back of the boat. The manta come to feed and do some looping just at the surface. It is just fantastic ! The nudibranch (Flabellina bostoniensis) was spotted making its way across a kelp frond in the shallows of Loch Fyne. The simple kelp background interspersed with small white worm casts made for a pleasing picture. The lighting effect was enhanced with a home-made bottle snoot on my flash gun to help render a dark background and leave my subject in the spotlight. This species is quite large for a British sea slug at around 3cm long. The somewhat pastel colours and long cerata make it one of the prettier species in my opinion. Accurate focus to ensure both rhinophores were sharp, together with careful composition and the shot proved straightforward enough to execute. Who'd have thought a British sea slug would be, or could be, beautiful! During a dive on the Manacles I came across a Painted topshell on a furry-looking kelp blade. This fluffy growth is actually a hydroid, made up of zigzag strings of tiny organisms. Both subjects are somewhat unremarkable but I thought there was potential for a simple, graphic shot, using the hydroids to create a textured background. I angled the strobes in towards the camera to create a very shallow beam, allowing the light to reach the shell and hydroids but keeping the drab brown kelp in darkness. The strands of hydroid lit up rather nicely, allowing the colourful topshell to ‘pop’ from its delicate lacy backdrop. When I was shooting this nudibranch I was focusing on it's behaviour to get just the right shot. While this happened a moray eel suddenly appeared out from the blue behind the nudi. I was shocked for a while but decided it would be a great composition. As a few minute flew by to my surprise another nudi appeared right behind the other one maybe to mate. Having both nudi's and a moray eel was a double surprise for me. I then decided to wait a while longer for the nudi to be in frame with the moray eel roaring behind. It took about 30 minutes to get this shot and it was well worth it. oh dear I didn't notice the giant eel face at first... that is terrifying. Despite appearances, these two Tompot Blennies are not kissing but engaged in a ferocious battle over mating rights. The British summer is mating season amongst Tompots and competition is fierce. I went diving under Swanage Pier in search of these charismatic fish and was delighted to encounter one with the ornate, blue facial markings designed to attract a partner. To my surprise and wonder, he was soon joined by another male and they started tussling. At one point, the dust settled and they remained motionless, jaws locked together, just long enough for me to capture this image. It was a very fortunate encounter and I am delighted to be able to share it through this photo. All those colours in their eyes! Amazing! Having been a free diving underwater photographer for 8 years, I swim many hours, every week looking for uncommon subjects to shoot. My preference is pictures made under the surface with reflections . A lot of creatures (mainly juveniles) are found there day and night looking for spots (floating sargassums, flowers, leaves and miscellaneous objects) on which to stay. This picture shows 3 blennies that gather by the dozen under a sheltered spot. In this image, they are hiding under a floating hibiscus flower. I count four blennies. There's one in the middle; one to the right of that under a petal; one directly below the center but not quite under the flower yet; finally, there's one to the left of the center fish, tangled in the Filaments and Stamens of the flower. Good hiding spot! Rays always look like they're smiling. I had been under Swanage pier for over an hour, I was getting cold and making my way back towards the entry steps. A little before getting back to the harbour wall there was a piece of the old pier with a hollowed out end. My eye was caught by movement within, a multitude of very small creatures moving fast to & fro. I had little time available and I fired off a few shots hoping the Nikon focusing would do its job. I had no idea what I had captured until I downloaded the images for review. I cannot say precisely what it is other than saying it is larval forms of a marine critter. I had a slow shutter speed dialled into the camera but the dark scene was frozen by the light from the flashguns. This is definitely a subject I would like to return to. The concept of the picture has been developed on two halves/layers. A half below - radial inside lightening with four flashes wired together. The difficulty was in the upper half, that is, to give the correct position of the three tec-divers with scooters, and to expire the bubbles approximately at the same time. Not to disturb the sediment, there was only one chance to get this shot. As for me, a great team work! Shark behaviourist Ms. Cristina Zenato has been studying Caribbean Reef Sharks near Freeport in The Bahamas for over 24 years The unique bond between her and the sharks allows her to get really close to them without putting them into tonic immobility and this has been helping many scientists, photographers and conservationists better understand and protect this beautiful species. Unlike in the movies, sharks in fact seldom attack humans on purpose and humans are not on their menu at all, on the contrary countless sharks are killed by humans just for their fins. Without these ancient animals the ocean will be completely different, and it will eventually become a disaster for mankind. Last year we spent two weeks diving out of Doune in Knoydart and carried out many of our dives in Lochs Nevis and Hourn. On one dive, in Loch Hourn, we were working our way up rocky ledges whose shallow vertical faces were covered with masses of brittlestars and plumose anemones. Amongst them was this fissure with an absolute abundance of fried egg anemones cascading down it. All were fully open with their delicate tentacles extended and their orange discs displayed. Patches of pink encrusting algae below them added colour too. Where space allowed writhing brittlestars added textural detail into a quite enchanting scene. The dive site is rather aptly known as ‘Pixie Gardens’. As I was using an entirely new camera type and system with wide angle for the first time on this trip I was more than happy with the results. It's the underwater Daisy garden I never knew I wanted/needed until now! The German ship Klaus Oldendorf went down in 1942 after hitting a mine. Today she is a very interesting wreck at 30 m depth to the deck. This picture was actually already planned on the deck of the dive boat. We were a team of three and all had been to the wheel before. We went through the photo plan thoroughly. First we took pictures with a top light (torch) and then with backlight. I took pictures with both flash and no flash and liked this one without flash more. It was important to balance the light correctly as I wanted to have the natural faint green glow in the background. This picture is a panorama of two images. This reminds me of a Bhuddist dharma wheel. Beautiful! Escaping the New Zealand winter for a magical week in Tonga's underwater dreamland dancing with whales, my wife and I spent 5 days and nights at sea, sailing the Ha'apai islands & swimming with humpbacks. Not another single boat was in sight all week. The beauty of the encounters that we had are truly transcending. These two adult humpbacks had such a connection with us in the water, literally "dancing" .. it was the most wild & incredible thing I have probably witnessed in my entire life. Humpback whales are such a magnificent species and they need our protection. The entire ocean needs our help. Now is the time more than ever, before it is too late .. before we lose it all. I hope that my photography brings out the ocean conservationist in all of us and helps to spread awareness to help save the ocean! It was an early morning dive at Adonara Island, Indonesia. Shortly after descending, a coral banded shrimp near a patch of reef caught my attention. She was waving her long white antennae leisurely, confidently advertising her presence. I had seen a number of interesting mirrored images produced by senior photographers and wanted to create my own. My idea was to accentuate the contrast of the translucent body against the opaque ruby head. I slowly closed in down to her eye level and took my shot as my subject continues to wave, seemingly unbothered. It is not easy to combine blue light in a traditionally lit image.You need to make the subject pop up while integrating the blue light into the photo naturally. Basking sharks are the world’s second biggest fish: they can grow over 10 metres long. Each year dozens arrive to the rich waters off the Inner Hebrides archipelago as part of their annual migrations. A bloom in plant plankton occurs in the warming springtime waters, which leads to an explosion in the numbers of animal plankton at the height of summer. 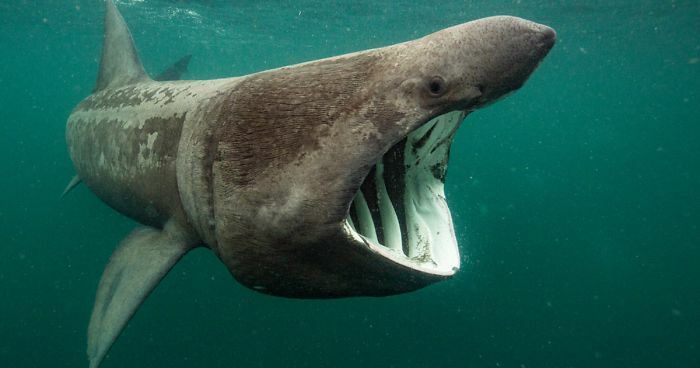 Just as these tiny animals feed on the microscopic plants, so the basking sharks feed on the zooplankton, pushing slowly forward with their massive mouths open to envelop clouds of their prey before filtering them out through specialised gill structures. It is possible to sensitively snorkel with these gentle giants - if spooked they close their mouths and change direction. I’ve learned that the best method is to place yourself some distance in front, stay completely still and hope for the best. That's awesome you shoot them with the utmost respect. Male corkwing wrasse can be stunning and I had wanted for some time to take an image that would show off the personality and vibrant coloration of this common UK critter. However, these wrasse are busy creatures, working hard to build a nest of seaweed, and then guarding it fiercely. They move surprisingly quickly and are adept at ignoring a camera lens. I found a corkwing nest on the wall of Bovisand Harbour, a favourite shore dive of mine, and didn’t have to wait long for the proud home-maker to appear with a mouthful of weed. He laid it down carefully and bustled away for the next morsel. This happened over and over again, and the most I got was a disinterested glance as he swept past. Eventually after several attempts I captured the characterful portrait I had envisaged. I went on holiday in Lembeh Strait, Indonesia with the aim of taking pictures of 4 subjects and one of them was the Hairy Frog Fish. I was excited to find one after a few dives. Once I had found it, I dedicated the whole dive to capturing it. I took several shots using two flashes, but the best result was the one using a snoot, as you can see in this picture. Hairy Frog Fish! Messy looking Critter. Tritone Alpestre, belonging to the family of salamandrids, fecund and lay its eggs underwater in small lakes, only in this short time of the year can they be found in immersion. We headed over to Brixham in the hope of spotting an Octopus as it's a species that's avoided me in the UK. There had been lots of reports of recent sightings by local dive guru Baz Drysdale so we were optimistic . The dive turned out to be a classic with three different octopus among many other species. Having not encountered one before I was surprised at how it seemed unaffected by our presence and willingly seemed to pose for photographs. This shot was one of about 30 I took of them that night and it seems to capture the octopus regarding me and my camera with great interest. Taking pictures underwater in the dark is always difficult but it does help if the subject is cooperative and I was really happy with the way this one came out. I have dived this wreck several times and I never get tired of it! This is a well known subject, a British World War II BSA M20 motorbike inside Hold 2 (port side, upper level) of the wreck. Usually I use strobes for this kind of shoot but I had to try this with two video lights, I think the result works well and the lights are useful, specially when you as the photographer can see how the light is shaping and working. Me and my guide from the dive centre at Mimpi Resort were looking for some Ghost Pipefish when we stumbled on these two lovely fish (Anthias. pseudanthias squamipinnis). The two fish were fighting; spinning around and around and just ignored us.